A part of Plano Stages (which also operates a pair of other Plano venues), the Cox Building Playhouse is a small, black box theater near Haggard Park. Spanning 2,400 square feet and housing 102 seats, this venue plays host to a handful of local theater groups, such as Rover Dramawerks, which has performed shows like Veronica’s Room and Dilemmas With Dinner. The Cox Building Playhouse has three separate seating configurations—end stage, three-quarters, and arena seating—which can alter the venue’s dynamic on a show-by-show basis. 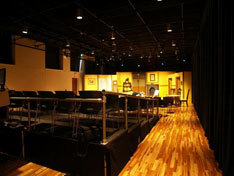 The theater has both performance and rehearsal space available for rent.